Have bike, will ski? Yes, with a BikeBoard Kit! The kit works with virtually any wheel/tire size through the use of a “boot” and pin and strap system. Then either choose to ride with a single ski on the front wheel or one on both the front and the back wheels in order to shred deep powder. Glide down the slopes on your bike and brake by shifting your weight to the back tire or if using 2 skis, stop as you would if on skis or a snowboard. 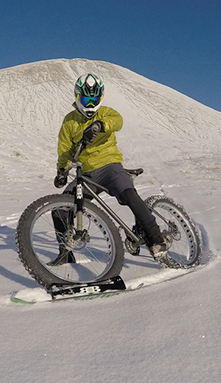 A fun way to “ride” your bike on snow!